Russian tennis star Maria Sharapova said on Monday she had failed a drug test at the Australian Open due to a substance she was taking for health issues, leading longtime sponsor Nike to announce it was suspending ties during the investigation. The 28-year-old Sharapova, a five-time grand slam champion and the highest paid woman in sports, will be provisionally suspended starting March 12, the International Tennis Federation (ITF) said. She is the seventh athlete in a month to test positive for meldonium, which is used to treat diabetes and low magnesium, and was only banned by the World Anti-Doping Agency (WADA) as of Jan. 1. "I know that with this I face consequences and I don't want to end my career this way. I really hope that I will be given another chance to play this game," former world number one Sharapova told a news conference in a downtown Los Angeles hotel. Two of Maria Sharapova's top sponsors have suspended ties with the Russian tennis star after she admitted failing a doping test. Sportswear giant Nike suspended its sponsorship, saying in a statement that it was "saddened and surprised by the news." Swiss watch brand TAG Heuer says its deal with the Russian will not be renewed. "We have decided to suspend our relationship with Maria while the investigation continues," it said. The ITF's anti-doping program calls for a four-year suspension for a positive test, but that ban can be reduced in various circumstances, such as for first-time offences or if the player shows no significant fault or negligence. If a player bears no fault or negligence, there is no suspension. From the shadow of Chernobyl's nuclear wasteland to international super-stardom; from penniless arrival in the United States, without a word of English, to a fortune nudging the $200 million mark. WADA declined to comment until ITF issues a final decision. Former world number one Martina Hingis retired after receiving a two-year suspension for a positive cocaine test in 2007, though the Swiss denied taking the drug. Sharapova is the richest woman in sport and with more than 15 million fans, she is the most followed female athlete on Facebook. Last year, the sport banned US player Wayne Odesnik for 15 years after his second doping violation, testing positive for steroids and other banned substances. Sharapova, one of the most popular figures in global sports, has long been a favorite with her sponsors. Cosmetics maker Avon Products Inc declined to comment on its endorsements. "Maria (Sharapova) is a leader and I have always known her to be a woman of great integrity," he said. 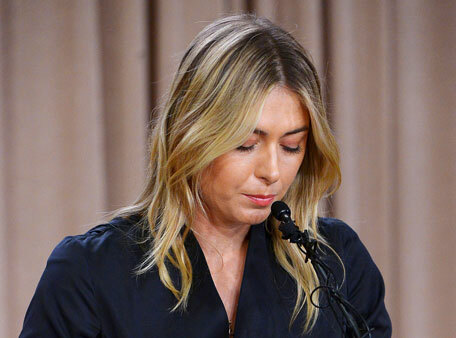 "Nevertheless, as Maria acknowledged, it is every player's responsibility to know what they put in their body and to know if it is permissible. The WTA will support the decisions reached through this process." That victory also made her the third-youngest Wimbledon champion, behind only Lottie Dod and Hingis, and the fourth-youngest grand slam winner in the open era after Hingis, Monica Seles and Tracy Austin.